Trajectory will stop at nothing to get V9 on a new episode of The Flash, tonight at 8/7c. 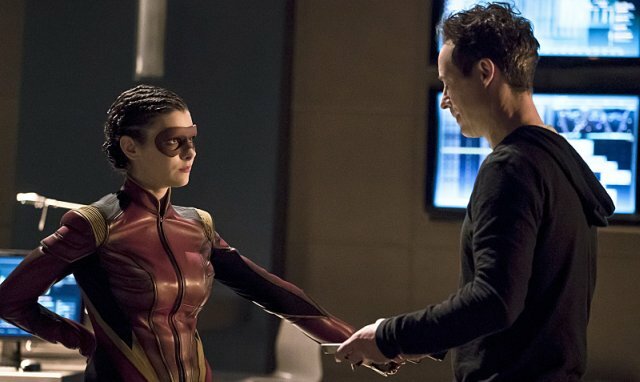 After another break, ‘The Flash’ is back with a new episode. ‘Trajectory’ stars Allison Paige as the show’s first female speedster. She’s causing havoc all over Central City and it’s up to Flash and STAR Labs to stop her. Meanwhile, Iris is facing a new assignment and things might be heating up with her new boss. Check the previews below including a behind-the-scenes look with one of the producers about Tuesday night’s episode. “Trajectory” airs Tuesday, March 22 at 8 PM EST on The CW. THERE IS A NEW SPEEDSTER IN CENTRAL CITY; WILL THE FLASH BE ABLE TO KEEP UP? -- Deciding to blow off some steam, Barry (Grant Gustin) and the team head out for a night on the town only to encounter an unexpected speedster who is up to no good. Iris (Candice Patton) is challenged by an assignment from her new boss (guest star Tone Bell), and is surprised when friction turns to flirtation. Glen Winter directed the episode written by Lauren Certo and Lilah Vandenburgh (#216). Original airdate 3/22/16.